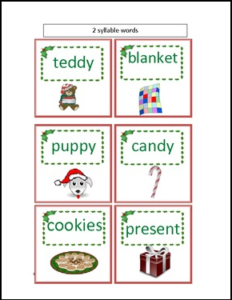 This 10 page document has students sort picture word cards of various items you may find under the tree under Christmas “holiday” tree for 1 syllable, 2 syllable, 3 syllable, or 4 syllable words. There are six words for 1 and 2 syllable words, six words for 3 syllable words, and there are four 4 syllable word cards. There are also blank cards for creating your own syllable cards. In addition, there is a recording sheet to go along with this activity for a group or individual, and an independent assessment sheet. This item is a fun way for students to learn and practice syllables, and can be used in a whole group, centers, or independently.